Happy Saturday! Well today is the first official day of fall and today is the 2nd day of pumpkin week! Today’s recipe is a good one. I don’t mean to toot my own horn, but sometimes you just have to. 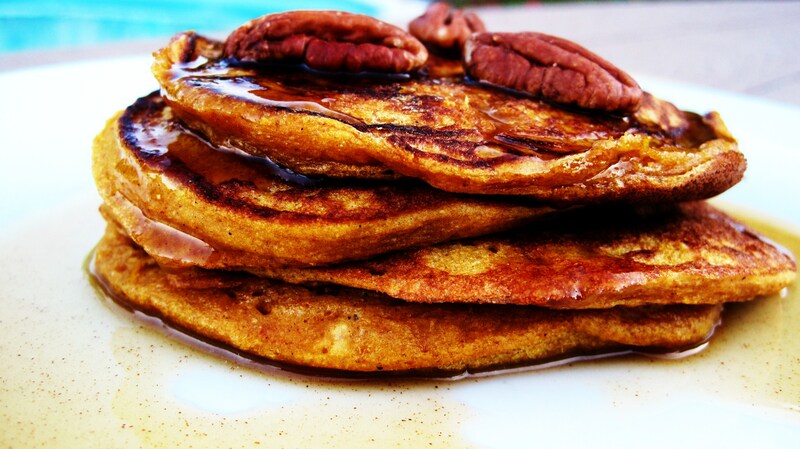 I made the most or should I say moist delicious pumpkin pancakes ever! Just look! They look delicious don’t they? They were! But first before I give you my recipe, I’ll tell you about my morning. After making this delish pancakes, Jenny and I went on a 90 minute 4 mile hell hike and let me tell you it was hell. 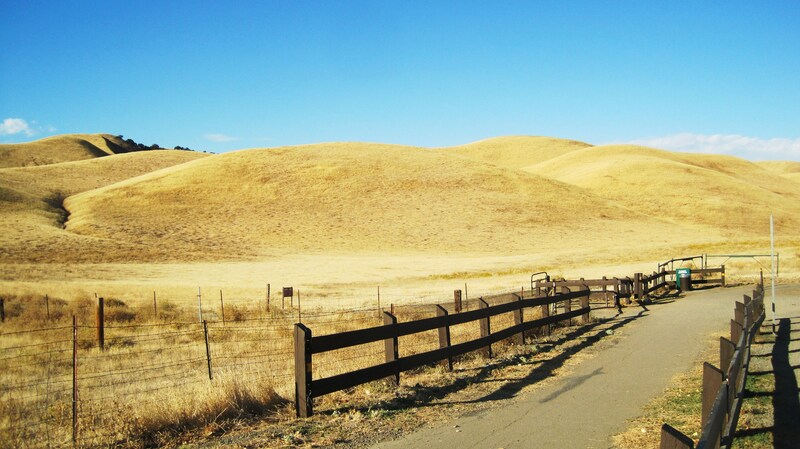 Every Saturday we go for a hike up into the foothills and today it hurt, since we slacked the last two Saturdays. I’m proud of Jenny because she pushed me to do it! It was hard. Here are some pics of the hike. 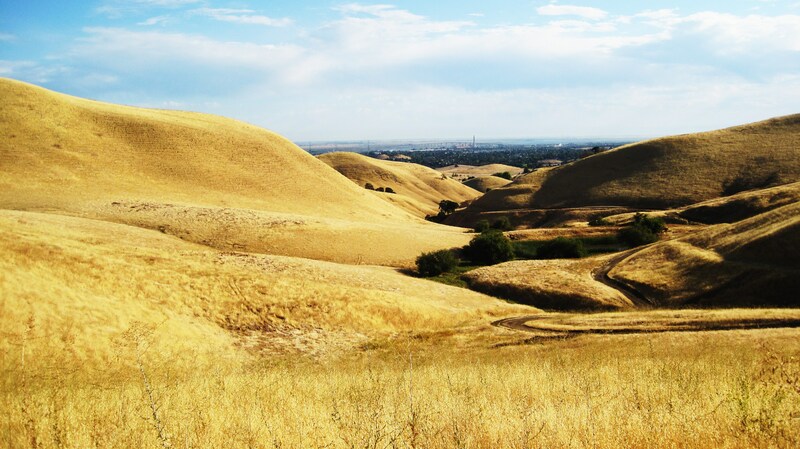 I guess you can see why they call California gold country. Doesn’t get the true fall effect here. This was so hard to climb. They have coyotes and snakes here too! Eck! 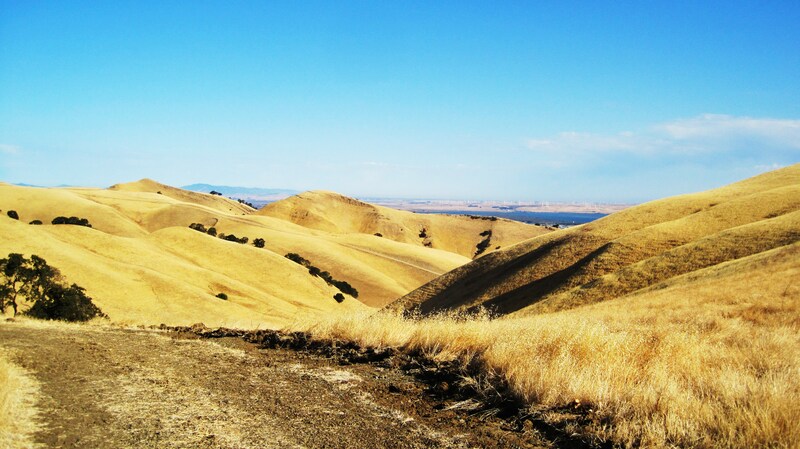 Made it to the top and now it’s down hill from here. Yah! So glad we did it and we burned about 600 calories, so that means we can have a good lunch! But I bet your waiting for that recipe. Just take a look at these first! You know you want some don’t you? To think they only took a few minutes to make. The homemade syrup really made them out of this world! Hey it looks like a little flying saucer. You want the recipe for the Cinnamon Maple Syrup? I bet you do! I suppose I can give that to you to, you deserve it! Sorry that pic is a little yellow, it was still dark outside. Ready for the recipe? No, not yet? 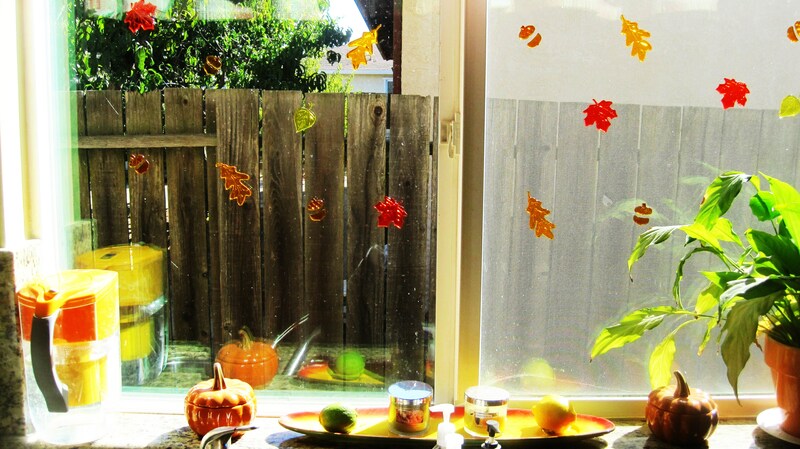 I bet you want to see my cute little leaves in my window. There cute aren’t they? I got them for $2.99 from Cost Plus. 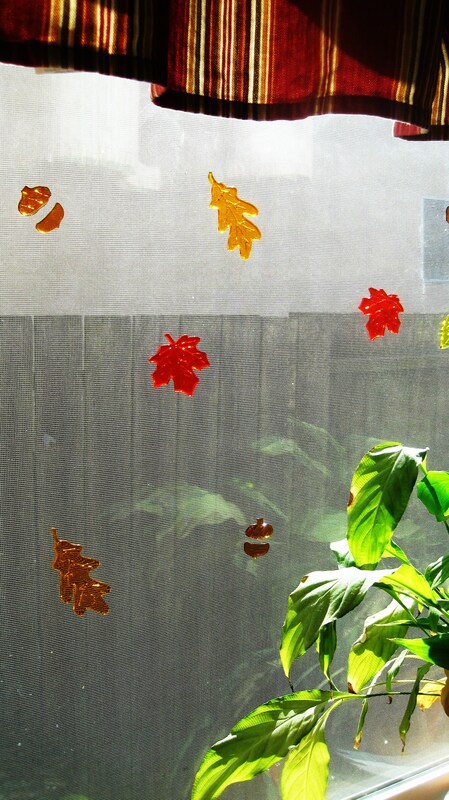 There jelled and will peel off in a snap! 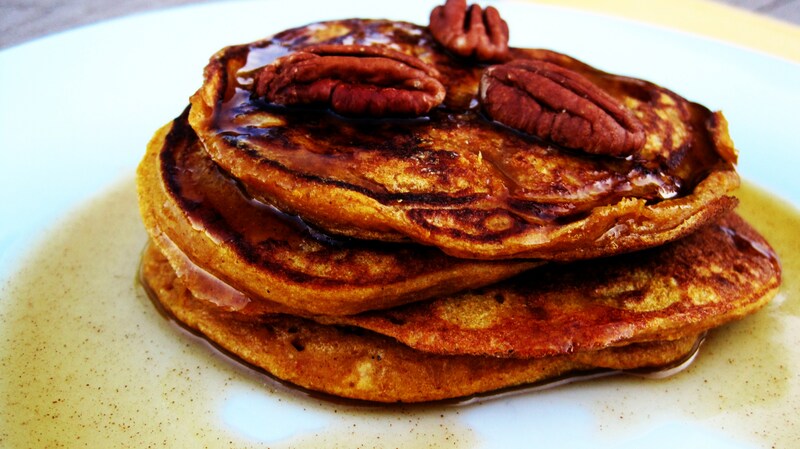 Pumpkin Pancakes with Cinnamon Maple Syrup – Adpated from my Whole Wheat Yogurt Pancakes. In a bowl add your pumpkin, yogurt, vanilla, and egg whites. Mix together. The add the remaining ingredients. Spray cooking spray in a skillet and set your burned to medium heat. Once the pan is warmed up, add 1/4 cup (I used a measuring cup) of batter. Cook for about 3 minutes, you’ll see it bubble. Then flip and cook for another minute or two. You’ll see the bottom of the pancakes turning brown. Do this for all remaining batter. I got 8 pancakes total. In a small sauce pan (set your burner to low heat), add your juice and cornstarch, and wisk until smooth and a creamy consistency, about 3 minutes. Add your remaining ingredients and whisk together until thicken, about 5 minutes more. Makes a little over 1/2 cup of Syrup. Calories for Pancakes: This is amazing, you are going to be so impressed when you read the stats! Calories for 1/4 cup of Syrup. By the way reserve some syrup for tomorrows breakfast, it will be perfect with it and no it’s not pancakes or waffles. You’ll just have to check it out to see. Hope you try them! Enjoy them, I did!!!! Now get out there and enjoy this fall weather!! 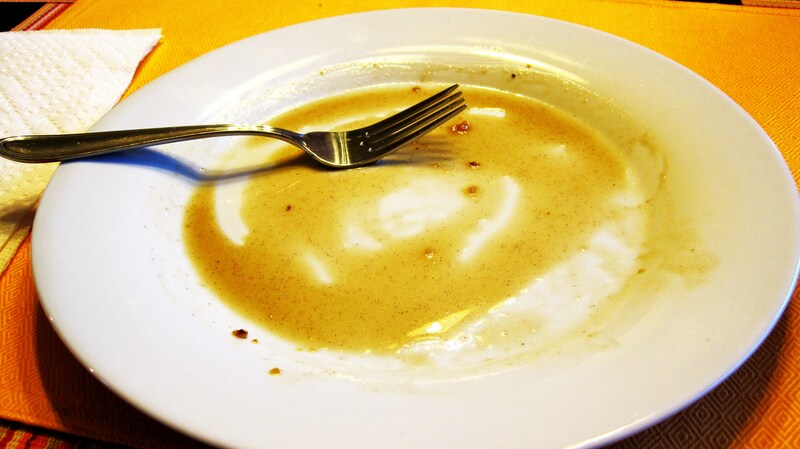 Ooooohhhh man those pancakes! 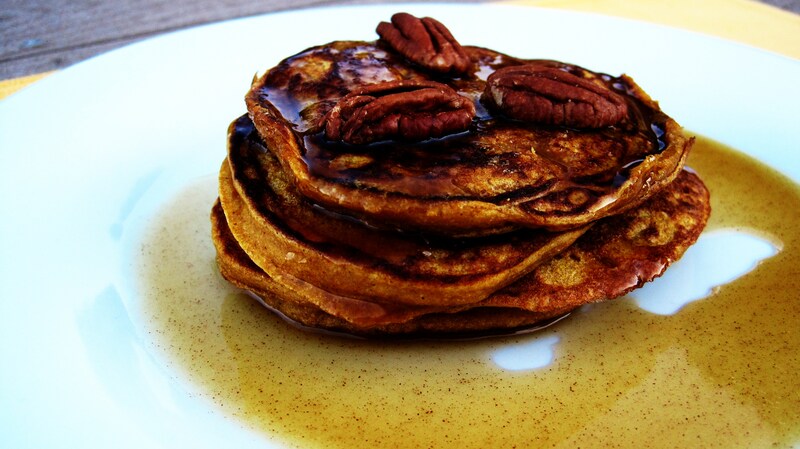 Those pancakes…they look amazing. The syrup is a super smart idea. You hit it right on the head. Thank you so much! That means a lot coming from you!!! You both are an inspiration! I love your recipes!! I absolutely love anything pumpkin. These sound delicious. Ok, these were Sooo good!! 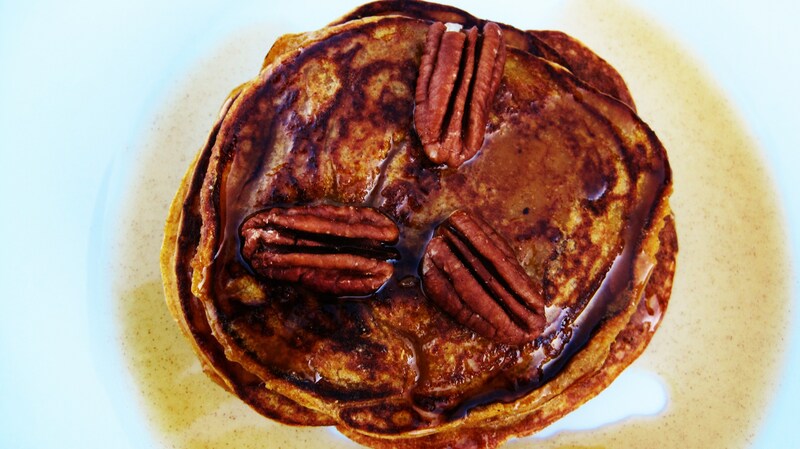 I love pancakes and these were so easy to make. I didnt make the syrup because i didnt have all the stuff, but i will soon. I got 6 pancakes, which was perfect for me and my son. I’m soo glad I found your website!! I am aso glad you tried them and like them! I tend to make these a lot lately, my Step-daughter loves them and always requests them. I love how many you can get for the calories, that i find unbelieveable! Have a great weekend!!! Oh good, I’m so glad you liked them!! If you decided to make a full batch, you can always freeze them. I have a batch in my freezer that I’m taking to work tomorrow. 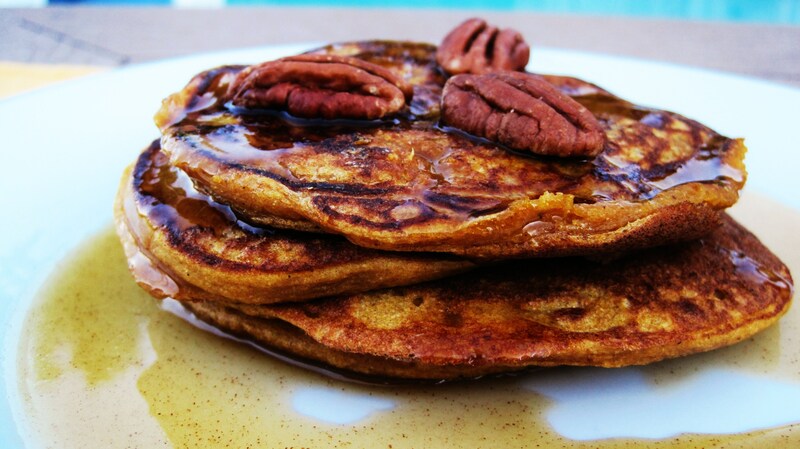 These pancakes are AMAZING! First time i made them I feel in love and made them everyday the rest of the week. Best pancakes I’ve made to date. Glad I found your site! So glad you like them. I haven’t made them in forever! I have to make them soon, especially since pumpkin season is right around the corner. I don’t have pastry flour. Does all purpose work?